The Topeak Wedge Bag II is a great way to carry around your belongings and has the additional benefit of a rain cover (excluding the Micro size) to keep everything dry in the event of a downpour. 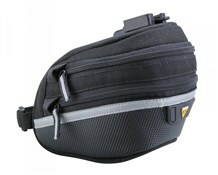 The Wedge Bag II is made from durable 1000 Denier fabric so it's strong but still light and the bag attaches securely and easily with a high quality quick release mounting system. 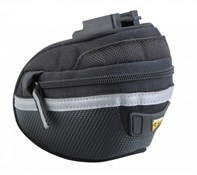 If you are looking for a small saddle bag that looks neat on the bike and sits far enough back to avoid leg rub then this could be the one. This bag will likely hold all you need for a road bike being just that bit larger than the minimalist bags many riders prefer. I can fit one larger inner tube for 28mm tyres, 2 x CO2 gas canisters and charging head, tyre levers, patch kit, small multi tool with room left for small cloth and rubber gloves without putting any undue stress on the zipper. The volume is a little less than the Topeak Aero Wedge Small that I initially tried but had to replace due to the set back of my saddle that caused leg rub on the bag and velcro strap around the seat post. 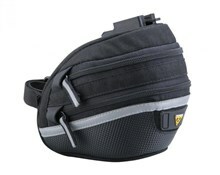 The Wedge Pack 2 is made to Topeaks usual high standards and as good as any other I've found on the market. The zipper and fabric appears strong and hard wearing and the design is unoffensive with additional reflective strip that works well. I would have liked a slightly better engineered quick attachment system but that provided seems to do the job providing simple and secure attachment despite just a small clip retaining the bag in place.I have ridden about 500 miles with this bag attached over some rough British roads without any problems and am now confident enough to recommend it for those who want a (Micro Only) bag that doesn't attach to the seat post.Additional extra mounts are available that allow quick swapping between bikes. Not too micro. Slightly more bulk then the previous micro version. Holds 2 tubes, tyre levers, multi tool no probs. no wobble with just the clip system and no strap. Great reflective strip arond the bag and well made zip and thick materials. 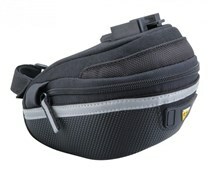 Excellent product good design strong zip plenty of room. ideal for purpose. 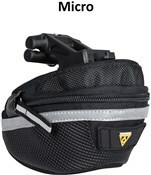 Had this saddle bag size medium for over a while now and its perfect. Like all Topeak products the build quality is always excellent. I keep an inner tube levers and a tool set in it at all times. I'm pretty sure you could fit 3 inner tubes in a size medium as the extra zip means it can be expanded. On rides I carry too many snacks to store in my jersey pockets so this bag is sooo useful.To top it off it comes with a waterproof rain cover. I could not ask for any more. Happy days.